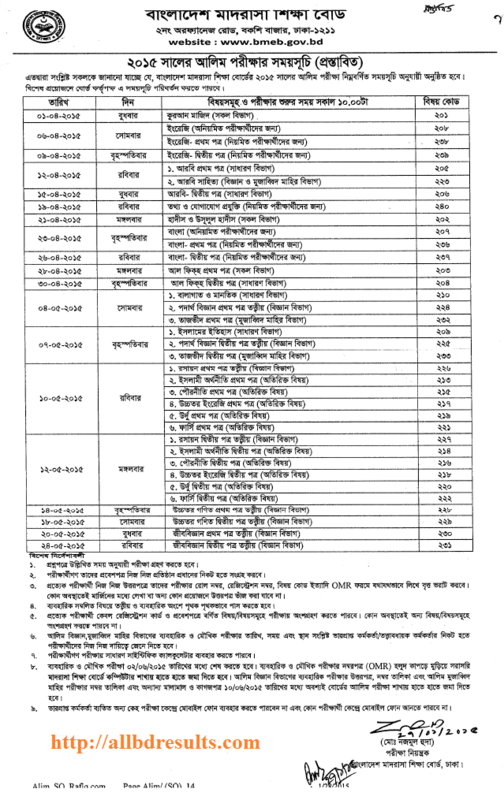 The education Ministry of Bangladesh has also published the rough idea of Alim Exam Routine 2015 of Madrasha Education Board. Always remember that this is not the final routine. The education ministry has invited opinion from the citizens of Bangladesh related to the rough Alim exam routine via a emai address which is [email protected] . If you have any opinion or problem with the below mentioned Alim Exam Dates then it would be good enough to mail your idea via the mentioned email address. Alim exam is equivalent to H.S.C exam of Bangladesh. So to pass this exam means you have passed the H.S.C exam of Bangladesh under Madrasha eDucation Board of Bangladesh.Download the Alim Exam Routine from the below given link. Hope it will help you a lot. Study well and take the perfect preparation so that every question seems common to you. Don’t attend the exam with mobile. You can use general scientific calculator in the exam. You have to collect your admit card from your own Colleges. For political unrest the above given Alim Exam Routine 2015 will be changed in several times. It is about 100% sure now. So to get the updated changed dates of Alim Exam stay connected with All BD Results by liking our Facebook Fan Page facebook.com/allbdresults and you can also follow us in Twiter. Leave your comments and feedback in the comments section. We will try to meet your demand. Don’t understand? Clear your comment please.